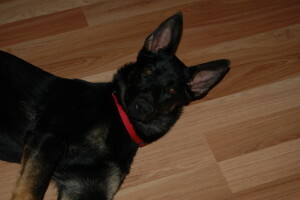 He was is a big, handsome, black and red coated boy who’d lost his way. In his first home, he’d never received training or guidance. As a result, his sweet disposition, his polite nature, and his excellent obedience skills became overshadowed by his resource-guarding behavior. Without guidance, he became aggressive, guarding his people, his food, and his territory in general. And because of his size and power, Ben could be dangerous and unpredictable. When I asked him why he was aggressive, he said that he was worried about things getting out of control. He was simply trying to establish order and structure. When he came to rescue, we paired him with a trainer and reinforced his training with a team consisting of our most savvy volunteers. In time, he settled into a more peaceful routine. But his past was imbedded in his character, and Ben would need a home with structure, gentle but constant guidance, and strong yet compassionate leadership. Ben was a stunning, commanding boy. He tipped the scales at 100 pounds and his long, luxurious coat made him seem even bigger and more imposing. He was with us for just a few months when he found his first home. But after eighteen months, divorce shattered his family. And Ben was returned to rescue. And we were back to square one. Ben’s training had been neglected. So we placed him in training again to rebuild the foundation we’d once built with him. And he needed a makeover. He’d gained twenty pounds while he was with his first family, so Big Ben was really big now. 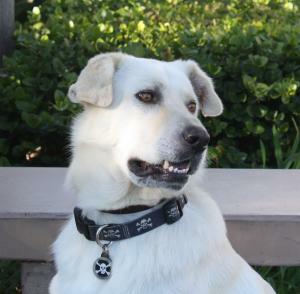 Despite his aggression issues, Ben was loyal and devoted and generally great with people. And despite the lack of training in his previous home, he had retained his knowledge of basic commands like sit, stay, down, up, and shake. All we needed to do was tune him up and look for a savvy and communicative home. Why? Ben was a talker. He loved to express his point of view via his vocal stylings! After a one-year wait, Ben found a family. 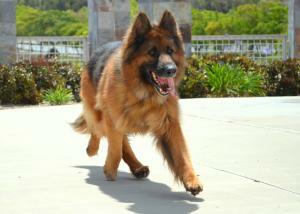 A husband and wife team came to meet Ben with their five-year-old GSD Baron in tow. They were smart, savvy people undeterred by Ben’s size and challenges. Baron was huge, big-boned, and also coated; he could have been Ben’s twin. Now Ben had a family and a brother. 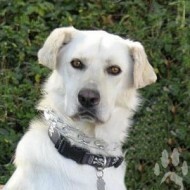 Sometimes when we have a dog like Ben, we wonder: will we ever find him or her the right home? Will we ever find a match? But we have faith that there’s someone out there for everyone. There’s someone looking for this dog. There’s someone willing to take on even the most challenging dogs. And it happens. The right family steps up. It’s all about timing. And when it happens, it is wonderful and inspiring. Ben now has a home where he knows exactly what to do. His boundaries are clear. He is lovingly guided and accepted. His mistakes are seen just as that, just mistakes that are correctable. His humans are committed to giving Ben the best life possible. They pay attention to everything and let Ben know he is home…finally really home. Gilmore, a happy-go-lucky senior, was named after the lead character in Happy Gilmore, the fun-loving golfer trying to make it in the big time. 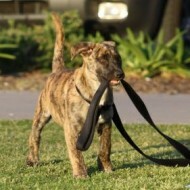 Our Gilmore loves chasing balls and romping with other canines big and small. While old age might have forced him into a more sedentary lifestyle, Gilmore was far from slipping into retirement. 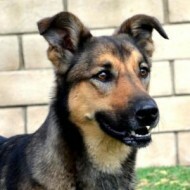 An eight-year-old classic black and tan, Gilmore was found as a stray. But his weight was good and he showed no signs of health problems. And he loved people. He seemed intent on pleasing volunteers and often showed his gratitude for being rescued by leaning into people and softly placing his head in a convenient lap. The day Gilmore joined our rescue, we got a call from a woman who was adamant about adopting an older dog to join her current pack and get him or her out of the kennels. It seemed like a perfect fit; she worked from home and lived on a property that would be paradise for a bunch of shepherds to frolic. So a site visit was scheduled to check out the new home. A meet-and-greet was scheduled to assess the compatibility of the pack members. Every test passed with flying colors, and it was love at first sight for the dogs and the humans. I used my intuition to check in with Gilmore in his new home, and Gilmore told me his new life is so much fun. There’s plenty of play time and plenty of hang time. He’s happier than he’s ever been. And he told me that it’s important to stick firm to your beliefs. His foster mom was adamant about finding the right senior. In fact, she waited weeks for a dog like Gilmore to come along. And her persistence paid off, allowing her to find the perfect new pack member. A comment Gilmore shared when I tuned into him was failure to communicate. I didn’t understand the meaning, so I pushed for more information. There’s the phantom of timing I was told. Now I was really confused. The phantom of timing? I had no idea what that meant and the message eluded me. Was the message referring to my failure to communicate? I was certainly failing to understand the purpose Gilmore was bringing to his new human. Hope. I bring hope. “In regard to what?” I asked. There were things there that needed fixin’. His voice suddenly had a decidedly southern twang, and I wondered if he was joking. But I was reminded that our animal companions and their power to help us is one of the reasons we love them so much. They calm us with their presence. They allow us to surrender to the depth we find in their eyes and their souls. They mend our hearts with their unconditional love. So many of life’s most important lessons are solved for us and modeled for us every day in our animal companions and their power to help us. There are indeed so many amazing ways animals help us. Often without us even knowing. Gilmore was right. If there were things there that needed fixin’, he was the man for the job. People have asked me why I wrote Finding Forever and the number one reason is that I wanted to change people’s perspective about their animal companions. I wanted to illustrate the volumes we can learn and the rewards we can reap when we really pay attention to our pets. 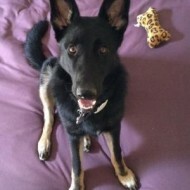 Before reading Finding Forever, people might have wondered…what can I learn from a group of abandoned German Shepherds seeking their forever homes? The answer may well surprise us all: We can learn profound life lessons. 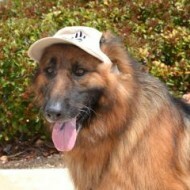 In 2009, I tragically lost my beloved German Shepherd, Blitz. Soon thereafter, I began volunteering for a local Shepherd rescue group. Now more than ever, I thought, I can really understand these deserted dogs’ shock, pain, and sadness. And I was ready to immerse myself in their healing. So imagine my surprise when, instead, it was I who was being healed. As the weeks and months passed, the abandoned Shepherds were teaching me profound lessons about life. One dog at a time, one story at a time, I was learning new, often-eye-opening things about hope, faith, love, courage, forgiveness, healing, perseverance, and more. And I felt called to impart those lessons to the world. In my book “Finding Forever,” I share awe-inspiring stories and their life-altering lessons for the rest of us. As readers, you’ll come to know 26 truly remarkable rescue dogs, including: strapping Spartacus, who illustrates the incredible beauty of opening a broken heart; Patience and Eve, both pint-sized and pregnant, who reveal the staggering power of friendship; and gentle, bunny-soft Annica, who teaches us the untold importance of living with a higher purpose. Animals are wise and wonderful teachers. They show us, among other things, what it means to love fully, deeply, and unconditionally; to live without judgment; and to forgive even those who have hurt us most. I’ve had readers tell me that they will never look at their animal companions the same way after reading Finding Forever and that the book changed their perspective about the animal kingdom. That’s why I believe that books can change everything. And that’s why I wrote Finding Forever. Today, I am a tireless crusader for animal rescue. As founder and executive director of Finding Forever, a foundation dedicated to raising money and awareness through writing and arts projects, I have helped numerous animal rescue groups, sanctuaries, and charities. I believe everyone has the power to help change the world. .
She was as sleek and fast as the high-end Porsche she was named for. And she got her name due to her previous guardian’s love of the brand’s premiere model, the Carerra. Carerra was a graceful, agile bicolor with a shiny black coat that was blinged out by accents of tan on her chest and feet. And at the age of just seven months, she’d lived with her current family for most of her life. Carerra was an affectionate sweetie who loved people, dogs, and just about everything…especially long rides in the car. She slept peacefully in her crate at night in the master bedroom with her people and never whined or complained about not being on the bed. 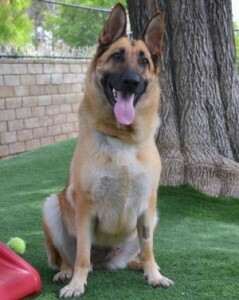 Playtime was a favorite activity, and she adored balls, especially tennis balls. She had a funny quirk of chasing balloons and biting at them as they bounced and bobbed along the hardwood floors in her home. Even better when she could sink her teeth into one and be rewarded by the loud pop as it exploded in her mouth. Life was good, and all was well in her world. But when a devastating illness struck one of the family members in her home, the family was overwhelmed with the stress and chaos of care-giving, and Carerra was sadly relinquished to rescue. Like her name implied, Carerra was a high-octane girl with energy to burn. When she came to rescue, she was first greeted by two of the core volunteers who love, love, love, bi-colors…in fact, they already had three of their own. But they seriously considered expanding the trio to a quartet as they were smitten with Carerra at first sight. While they deliberated, Carerra went into foster with other long-time volunteers, a family who’d fostered dozens of dogs over the years. The happy ending? The family became first-time failed fosters and decided to give our girl a forever home. I guess they’d been holding out all along for Carerra, and we couldn’t think of a more perfect home for our beautiful girl. When I tapped my intuition to check on her, she simply responded timing is everything. The time she had in her first home allowed her to understand and receive love and compassion, but when timing also meant she would lose her home, a window of opportunity connected her quickly with the right family. Timing is everything. It has the power to heal, to put us on our intended path, to allow us to manifest what we need when we need it. Each event leads us to the next step and the one after until we are exactly where we are meant to be. Eighteen months ago, Carmen’s world was shattered. Her elderly owner, a woman she’d lived with her entire life, passed away. Unfortunately, the remaining family members did not want her, and Carmen was left at a kennel while the family paid for her monthly board. She languished there for more months, waiting for the only human who ever loved her to return to take her home. That woman never came. And as a result, Carmen began to give up. As our rescue volunteers came each day to care for our dogs sheltered in the same kennel, it was hard to ignore Carmen. She was sad, fearful, and downcast. In her first and only home, Carmen was isolated with her elderly owner and so she was shy and afraid when she met new people. And as her time in the shelter grew, so did her fear. Our volunteers made a promise to themselves and to Carmen. A promise to do everything they could to help find her a home. Volunteers began spending time with her. Trying to bond. Trying to connect. Trying to gain her trust. At first, Carmen would approach them slowly and hesitantly. But at the first hint that one of them might touch her, she’d turn and run for the safety of her bed. Then she’d work up the courage to approach again, only to turn away and cower. After a few days of cat and mouse, she crawled toward our volunteers on her stomach. As she came closer, a glimmer of life crept into her eyes and the emotional walls that had imprisoned her began to crumble. As days and weeks passed, she learned to trust her new friends, one at a time. Finally, she allowed herself to be petted and even began to give kisses! And in the play yard, we found that she could run faster and jump higher than any of our dogs. She somersaulted over hay bales, flew around the play yard, and romped in the pool with her new toys. Her favorite game was thrusting her face into the water bucket, rolling in the dirt, and then diving back into the bucket once more to wash the dirt away! Then we were leveled with bad news. Carmen’s remaining family had decided to relinquish Carmen to a sanctuary—a world of forgotten dogs that belonged to no one. And we knew we had to keep our promise to this little girl and help her find a home with a family who had the patience to work with her and build trust. If the eyes are the window to the soul, anyone who looked into Carmen’s eyes saw the sweet, intelligent soul that resided inside. Fate finally intervened, and the family finally agreed to relinquish Carmen to our rescue. And she began to attend adoption events and meet prospective families. But she was still fearful of strangers. Especially men. Adoption applications began to stream in, but none of them were the best of fits. Some had small children; others had unfenced yards. So we continued to search for the perfect family. One day, a new application came in. The family wanted to meet Carmen. 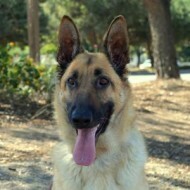 They met us at the kennels, and as the husband and wife approached her, Carmen ran straight toward the husband. Even though she was afraid of men! Within minutes of meeting them, she was offering him kisses and her paw. When the husband and wife returned to see her a second time, Carmen ran to the fence to greet them, wagging her tail with joy. I think dogs know when they’ve found the right family. They know when they’ve met “the one.” Carmen had bonded with many of our volunteers, but when it came time to say goodbye, Carmen quietly acknowledged the volunteers who’d grown close to her, jumped in the back of her new family’s car, and never looked back. Little Carmen had waited so long for the right family and finally it happened. And that’s how Carmen found the one! 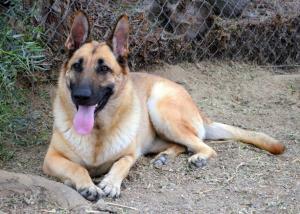 She’s a stunning, soft blond German Shepherd. A hint of black peppers her back, and a pale white, crescent moon–shaped choker frames her chest. When she found her way to rescue, she was battling a horrific ear infection so severe that one eardrum was ruptured. The poor girl was in severe pain. Terrified, alone, and unsure of her future, Blondie shied away from volunteers’ attempts to befriend her and win her trust. So we socialized her by using other dogs to win her trust and bolster her shattered confidence. In time, she warmed up to her rescue playmates and slowly, surely, our beautiful girl began to come out of her shell. Volunteers continued to rally around her. Her ears healed. Confidence and joy began to replace her fear and pain. She gained trust in bonding with other dogs during playtime. 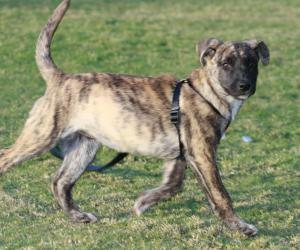 And she frolicked in the play yard, bounding over hay bales and racing side by side with our other rescues. During her photo shoot, she posed politely, and with each lady-like image, seemed to know that she was being captured for posterity. It was as if she knew that each photo posted on the website was a beacon to bring the right family to her. When the day came to meet the resident cat at the rescue kennels, Blondie slowly approached him as he lounged nonchalantly in the arms of one of our volunteers. She sniffed and then sweetly licked the cat through the chain-link fence. Our gentle gem was also good with small dogs. Both of these traits would make her easier to place. She grew to love and crave her time with humans, seeking their affection and loving touch. But still something was missing. Still she yearned for a place and a family to call her own. One day, a gentleman came to one of our adoption events and talked to a counselor about his wants and needs in his next dog. He had lost his long-time companion dog just weeks earlier. 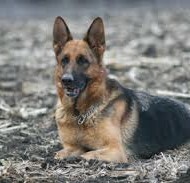 He was still grieving, but Blondie was an imprint of his dog, and the resemblance between them activated the part of his heart he’d closed off after the loss of his beloved Shepherd. A few days later, he put in an application for Blondie. A meet-and-greet was arranged in order to get a glimpse of the life this gentleman and his GSD companion had had. He is a retired military flier and took his dog everywhere, including Oregon, where he spent summers vacationing and volunteering at the state parks. He and his dog provided tours for the children that visited, and the pair taught visitors from all walks of life how to enjoy and get the most out of park life. A long-time Southern California resident, he’d lived in the same neighborhood for years, and everyone who had known him fell in love with his dog. He knew Blondie would have the same effect for she’d stolen his heart and begun to help him heal within minutes of meeting her. It was an excellent fit. Blondie’s new name is Cheyenne. The neighborhood has already all met her and announced her wonderful. 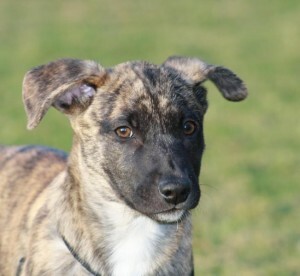 Blondie is well and happy and has her forever home. And her human? He adores her. And he has a companion for his trips to Oregon. He has a companion for life. When I pondered the importance of their fated meeting, I think it is far more than Blondie finding her forever home and he a lifelong companion to fill the empty void in his heart. I tapped into my intuition and heard the following message. They are pathfinders for one another. Showing each other the way and bringing each other back to center. Their relationship is like a mathematic extrapolation of the old adage: Home is where the heart is. I think their union serves as a navigation system of sorts, a beacon to help each other find their way through the world’s energetic structure. Like sonar or radar or an internal homing device, together they will help each other navigate through life and return to center, to home base, and to heart.